windshield replacement Toronto is the best windshield replacement facilities offering firm serving our clients for many years now. We employ efficient staff to replace your windshield for affordable cost and furnish insurance claim. We,at Premium Auto Glass, try hard not to replace your windshield unless the damage is very severe and only if windshield replacement is inevitable .When you hit the road for the most significant vacation of your life with your family and a stone or a small rock hits your windshield ,a crack or chip appear on it after the collision.This is termed rock chip repair or stone chip repair. Owing to the traffic laws of Canada,you are not supposed to drive your car without fixing it. call us, premium Auto Glass for your Windshield chip repair service from any location, we serve you in no time. If the chip or crack is less than 25 cents coin size, We will repair it within half hour and would charge nothing if you carry insurance . With no insurance ,you have to spend $75 to 100,with life time warranty. You would come across a lot of cheap repair services but they wouldn’t provide life time warranty,their repair would work in summer,but in winter the crack will expand and result more damage.Choose Premium Auto Glass for best service.If the crack is beyond 25 cents coin size; no one else would repair it but replace your windshield which will cost you a lot. Premium Auto Glass would repair cracks of up to 6-7 mm size and will give you one year warranty since we value your hard earned money. We opt for windshield replacement rarely after trying all options to repair it and saving your money manifold . We use efficient state of the art OEM 35 glass made of high quality for windshield replacement . We charge 25% less than the actual cost of this glass than others charge. OEM 35 glass that we use for windshield replacement of any brand Automobile that would be equivqlent to the manufacturer’s glass. 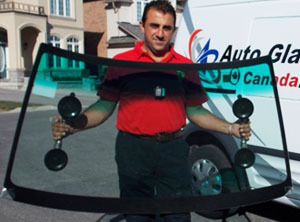 Premium Auto Glass is the Numero Uno windshield replacement firm in Toronto. We employ expert technicians with 20 years experience to handle windshield replacement services for you. you can get your windshield replacement done for no cost if you have insurance covered . We tie up with all leading insurance companies in Toronto ,Canada and handle the entire paper work avoiding the wastage of your time. We also offer $10 gas card if you use our windshield replacement service. This is first time ever such an offer being introduced for just availing one time service. We get utmost satisfaction by giving back to our clients who give us windshield replacement assignments. We have our Service centers all over Toronto and we work 24/7 to serve you. you ca dial us anytime from any location, our technicians will reach you with in half hour and perform windshield replacement promptly. Call us right away for your windshield replacement solutions with us, Premium Auto Glass.